Serafino Arcaro first appears in Painesville, Lake County, Ohio, in 1928. 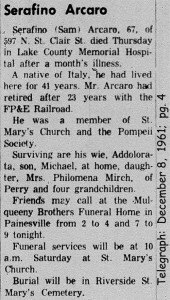 Serafino Arcaro, and his wife, Anna Maria Stanziale, moved from Wickliffe, Ohio, before the birth of their first child, Michele, in 1928. 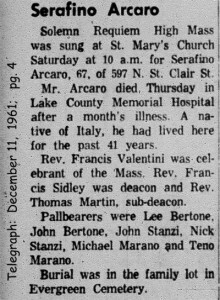 At the time of death, Serafino resided at 597 North St. Clair Street, Painesville, Lake County, Ohio. In America, Serafino Arcaro was known as Sam Arcaro. Serafino Arcaro was born on February 20, 1895, at Sant’Angelo in Grotte, Italy. He married Anna Maria Stanziale, daughter of Emilio Stanziale and Nicoletta Ruberto, in 1920, in Italy. Serafino died on December 7, 1961, at Lake County Memorial Hospital, Painesville, Lake County, Ohio, at age 66. His body was interred at Riverside Cemetery at Painesville, Lake County, Ohio. Serafino Arcaro, age 21, immigrated to the United States on March 20, 1916, travelling to Conneaut, Ashtabula County, Ohio. He was joining his cousin, Giovanni Arcaro, in Conneaut. The passenger ship manifest stated that Serafino Arcaro was married to “Rosina”. Mr. Arcaro registered for the draft for World War One on June 5, 1917. He was living in Conneuat, Ohio. He was married with a child, both living in Italy. Serafino is shown as re-entering the United States on November 21, 1920. 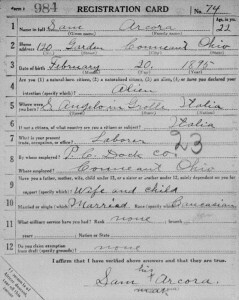 He was returning to Erie, Erie County, Pennsylvania where he lived 1916 to 1920. The passenger ship manifest stated that Serafino Arcaro was married to “Adolarata Stanfiaro”, who was living in Italy. 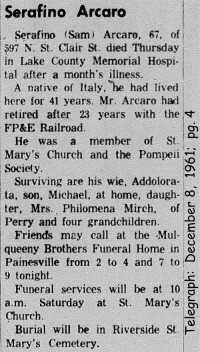 Serafino Arcaro must have been married twice. He married his first wife, “Rosina”, sometime before 1916. 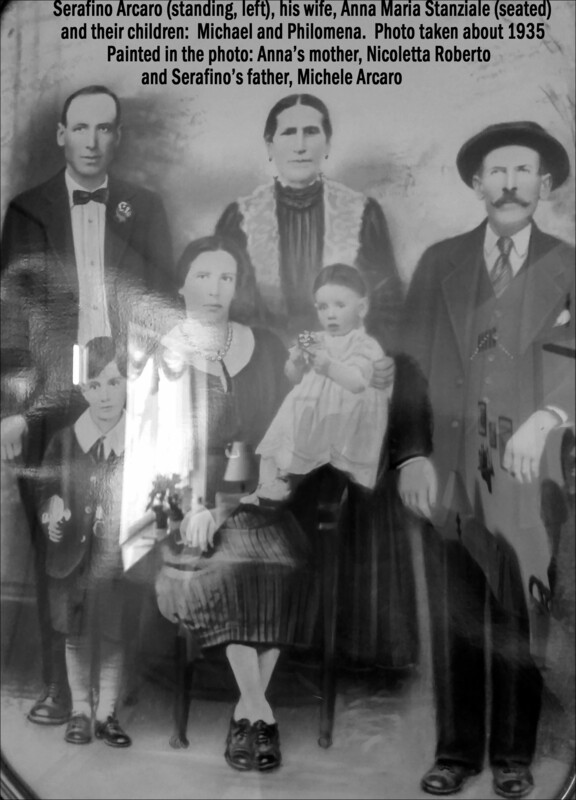 They had a child, then Serafino immigrated to the United States. Rosina must have passed away between 1917 and 1919. When Serafino returned to Italy after World War One, he married second, Anna Maria Stanziale. Anna Maria Stanziale joined Serafino in the United States in 1927. Serafino Arcaro established residence in Painesville, Ohio, about 1924. Serafino was a witness for Michele Marano when Michele became a citizen of the United States in 1929. In the 1930 and 1940 Federal Censuses, he was employed by a nursery. He went on to work for the FP&E Railroad for 23 years. How Serafino Arcaro was related to other Painesville Italians, Carmella Arcaro, Domenico Arcaro, or Antonio Arcaro is not known. 1. Michael Arcaro was born on October 20, 1928, at Painesville, Lake County, Ohio. Michael died on September 6, 1933, at Lake County Memorial Hospital, Painesville, Lake County, Ohio, at age four, He was struck and killed by an automobile. His body was interred at St. Mary Cemetery at Painesville Township, Lake County, Ohio. 2. Philomena Arcaro was born June 25, 1932, at Painesville, Ohio.. She married John Mirch. 3. Michael J. Arcaro was born on April 7, 1937, at Painesville, Lake County, Ohio. He married Shirley Morgan in August, 1959. Michael died on January 4, 2013, at Heather Hill Hospital and Health Center, Chardon, Geauga County, Ohio, at age 75.